Simply put -- THESE THINGS ROCK! All our SK8KINGS Completes come equipped with Oust Moc Series Bearings and we strongly recommend their use with our wheel line for the smoothest, fastest ride possible. Invest in the best! EXTRA VALUE: Don't forget to protect your new set of Oust Moc 5's with Oust Speed Lube. Add on above and SAVE on shipping costs! Oust MOC 5 Street -- Street skateboarding is a combination of asphalt, steel and concrete interrupted by moments of fright, terror, and indecision. A special bearing had to be developed to accommodate a wide range of ages and styles of skating. One that would hold together in any condition, without giving up speed or load capabilities of the MOC 5 Tech. The metal shields replaced the buna seals to reduce the possibility of damage to the buna seal during assembly . A small oil hole ( Pat.Pend ) in each shield was put in so the bearing could be cleaned and oiled. Tolerances were changed to accommodate the new environment and the Oust MOC 5 Street was complete. It's the fastest and toughest bearing in the industry for street. Oust MOC 5 Tech -- The Oust MOC 5 Tech Bearing was designed for endurance in technical skateboarding. Some of the roughest conditions in skateboarding are reached during the ollie's, blunts, grinds, and tricks of technical skating. To maximize the strength of the MOC 5 Tech bearing a high strength carbon steel ball cage was used. This cage would ensure ball placement in the harshest environments and extend bearing life for thousands of skating hours. The MOC 5 Tech bearing is manufactured with the same high precision specification as the MOC 7 Speed. The Only Bearing Engineered Specifically for Skateboards. 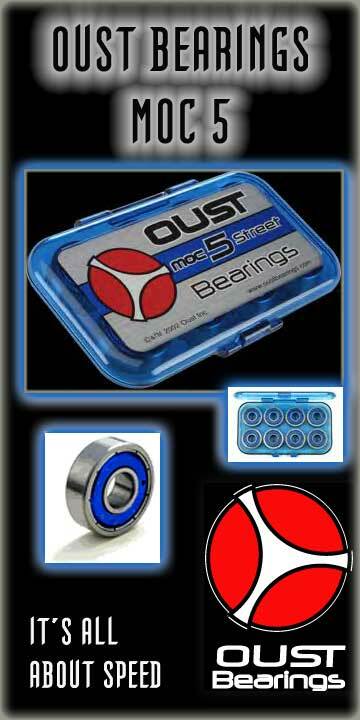 After several years of research Oust Inc. has developed a hybrid skateboard bearing named the " MOC SERIES ".